I mounted this scope on my 30-06 and I have taken it to the range about 5-6 times now. As expected, the scope has held and maintained its zero perfectly. Not that I am surprised; it was clear when I received the scope that it was remarkably well made. In a world of subpar $1000 scopes with questionable reliability, you will not find one you can count on like this beauty. I cannot wait to buy a second one! I have had this scope since January and have not really had a chance to stretch it out. This past week I spent a day in Wyoming shooting at 850 yards in 25mph crosswinds with a home built AR in 6.5 Grendel. This scope performs outstanding. The glass is clear edge to edge without distortion at every magnification. The clicks for adjustments were clean and positive. The reticle stays clean and clear after initial ocular adjustment through all magnifications. The parallax adjustment is spot on. The tracking is excellent and very repeatable. If you are looking for a long range shooting scope on a budget, this brand should be at the top of your list. Thanks again SWFA! You will never be able to buy this quality of a scope for the money you will pay for this one. I almost never give a five star review, as I believe improvements can always be made, along with maintaining the price point. With that being said, this is an awesome scope at this price point. I purchased under the normal retail price making it an even better deal. Reticle is clean and precise; tracking is pretty spot on for a scope in this range. I shoot with many people that use Nightforce and Vortex, and for the money they spend, I just do not see the need. If I were going to spend money on a better scope, I would skip that price range and go to a US 0ptics, something European, or maybe Steiner. The next SWFA scope purchase is going to be one of their HD scopes to see how those stack up. The adjustments are precise; clicks are positive, and audible. Glass is clear, even at the edges and through all magnification range. Like I said, I would put this scope up next to any $1000-1500 Japanese scope all day and not feel out scoped. Are they fancier and prettier, probably? Are they any better? Not until you get over $1500 in my opinion. You will not find a better long-range scope for this price. This is one of the best scopes I have used, or owned. The glass and the coatings are very good, but what really stands out is exceptional reticle design and tracking accuracy. Dialing come-ups reminds me of a Leica film camera in which you can hear the precision of the mechanism doing what it was made to do. You feel and hear solid, even clicks and that gives you confidence in the scope, which gives me confidence in my shot. I keep this scope on a Sako in .300 Winchester. I used a Lead Sled and a five-bulls-eye target to get a zero and I was able to get on the center square without a peek. I just dialed half the number of clicks up and left and I was there. Dialed the same down and right, just for the heck of it, and was dead on where I started. That was impressive for $699. 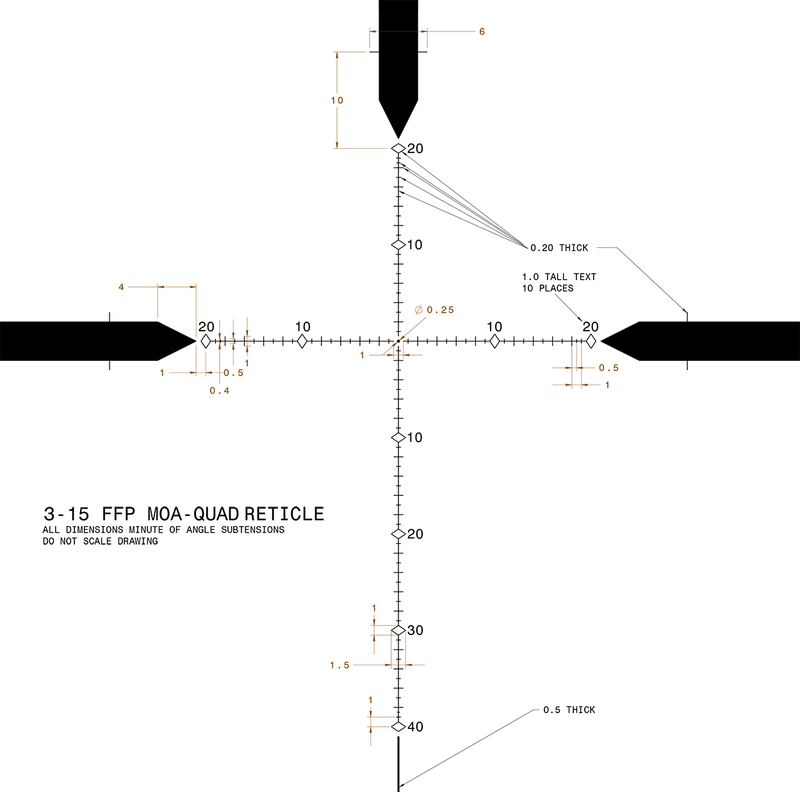 The reticle: You can range your target or hold over/under or hold for wind or lead, just like all the other mil dot/hash mark/ranging reticles can do, but the SWFA reticle does it without cluttering up your sight picture. Let us face it, some of the reticle patterns are like looking through a screen door and the crosshairs are illuminated just so you can find them. The SWFA pattern has all the info you need to do what you want to do without the value 10 wind trigonometric angle solution calculating cascading sub-tension and your target is gone. As for the price, I do not know how SWFA does it. I own the 3-15x42, two fixed 10x42 and a 1-4x24. I would trade them for a Tangent Theta, but not much else. That is how good they are.